I've probably ridden my Fahrrad Manufaktur 3000 miles since I bought it 4 years ago, so I shouldn't be crying over an expensive service. But at about £200, that's half what I spent on it new! But never mind. I booked it in at Bicycle Workshop almost three months ago, so I've been looking forward to today. During the wait, I've been unable to shift into gears 1 or 2, so certain hills have been off limits (and I don't think I've been doing my knees any favours either). 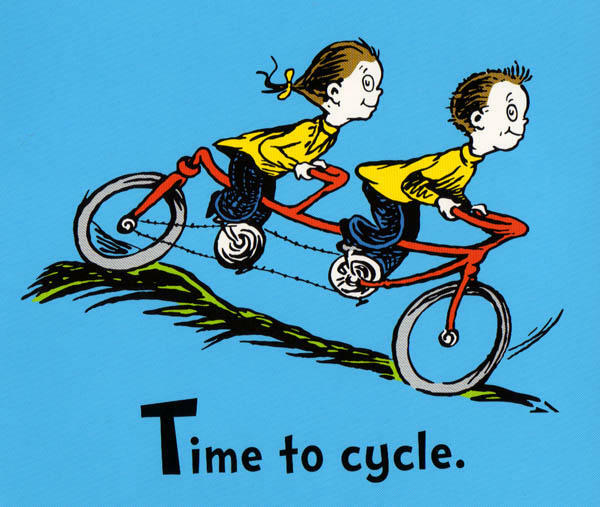 Turns out I needed a new rear tire (Schwalbe Marathon), a new crankset (since the teeth on the chainwheel were worn out and it isn't detachable), new pedals, brake shoes, and various cables. All in all, about a hundred pounds in bits and another hundred in labour. Considering the work they did, not bad. Plus, they're so completely friendly there - and they remember my name too - it's actually fun to drop in there. Not like virtually every other bike shop I've been to in the past ten years! Worth every penny. 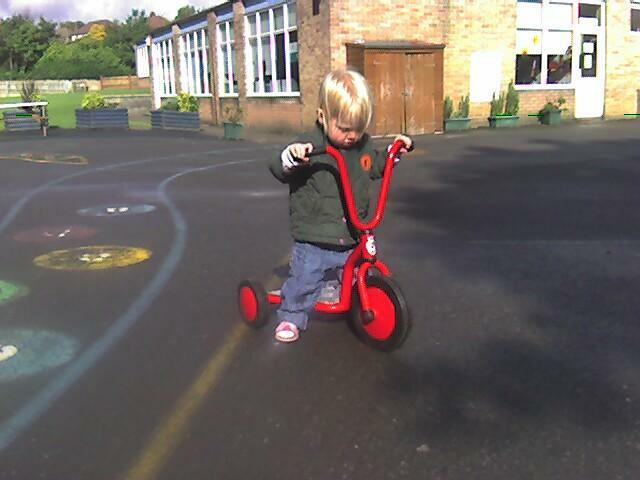 We turned up early to swimming class yesterday, and found a big empty playground with a bunch of really nice little three-wheeled contraptions! Gem was able to make two of them go under her own steam. Kim becoming a cycle trainer! Kim has just started a four-day course to become a certified cycle trainer! 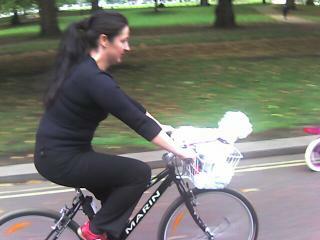 She's being trained by Cycle Training UK, the biggest provider of cycle training in the country. I've come across these guys lots of times, and they do a really good job - and I'm sure Kim will be a great trainer. It's nice that there's a bank of cycle stands right across from the entrance to the London Zoo. It's in a tiny car park that never has many cars in it for some reason. The cycle stands are well enough designed, but not as efficient as plain old Sheffield stands. On the nice sunny Saturday we came along, most of the stands were occupied - but with motorbikes and scooters, which were expressly not allowed. Where are the Community Support Officers when you need them? Gem and I had a lovely pique nique in Regents Park today, and we were treated to the sight of a couple Community Support Officers staking out the Broad Walk. No cycling is allowed on the paths of Regents Park, and they were stopping cyclists and reading them the riot act. I'm all for it! 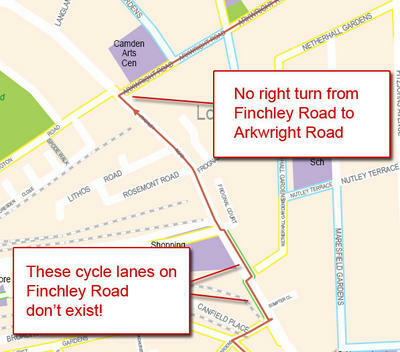 I know some of my cohorts from the Camden Cycling Campaign don't agree with me on this, but I always try to be completely law-abiding - so it drives me mad when bikers flout the rules. We ran over to them and told one of them that we supported their work - he was completly humorless about it. He did say that they're explaining the rules to people now (I asked if he'd given anyone a ticket and he wouldn't tell! 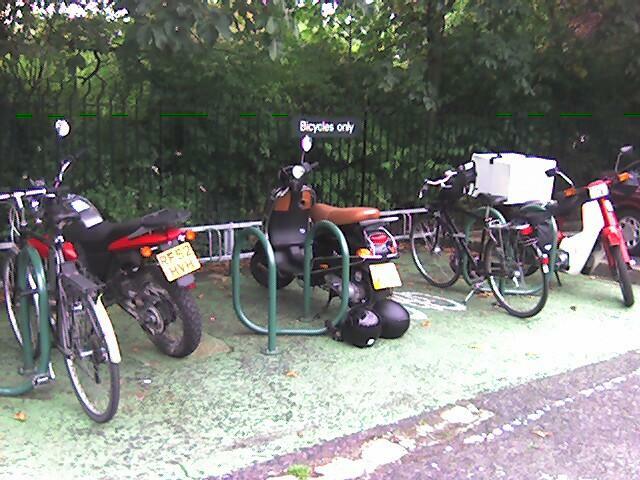 ), but soon they'd start handing out £200 fines on the spot! 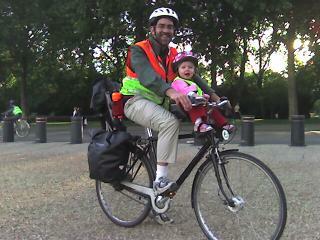 Great route to Crouch End - thanks TfL! I had to ride up to Crouch End for a meeting the other day, and it was a great opportunity to try out the new cycle mapping utility on the Transport for London website. All in all, it works really well! The tool itself is really clever; it's the same one we use to figure out routes on public transport - only choosing the "cycle only" option. It generates a nice PDF doc with an overview map, and then detailed pages with clear maps and step-by-step directions. 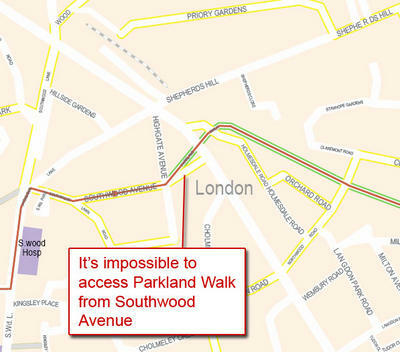 The route I tried is a tricky one, with Hampstead Heath between me and my destination. It ended up being about 2km longer than Multimap's route (for cars), but it sent me via the cycling paths through the Heath, and a long stretch along the lovely Parkland Walk from Highgate to Crouch End. There were only a couple wierd bits in the route it came up with for me. 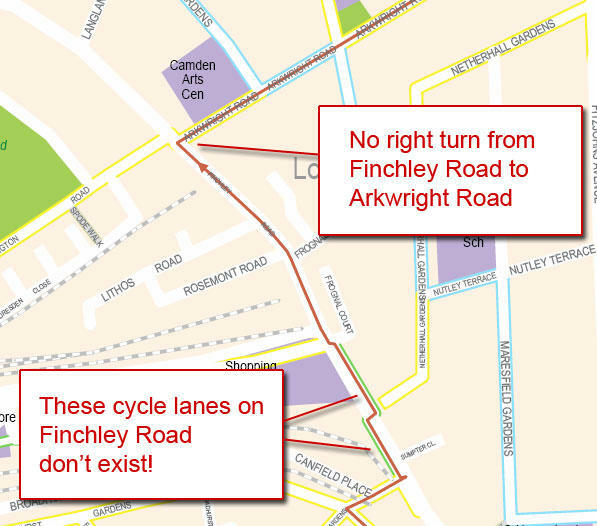 First, it identified two cycle-only paths along the Finchley Road where no such things exist, and it recommended that I turn right at the Camden Arts Centre, when that's clearly not allowed. And the only other problem was getting onto Parkland Walk in the first place, which is always a bit troublesome.... but I got there in the end! 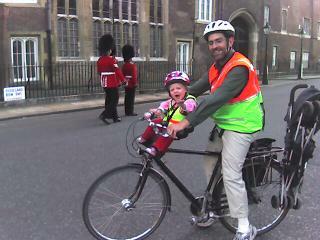 Today we biked to the Thames Festival. It's a really fun extravaganza that stretches all the way from Westminster Bridge to Butler's Wharf. But the real fun was cycling there and back. ... where we walked our bikes. Just too treacherous going across all those lanes of traffic trying to turn left. But we hopped back on at the bridge, where we met a retired couple on Bromptons who also thought the square was a nightmare. We were pretty hungry at this point, so we stopped at the Bagel Street just behind County Hall for a BLTCC, and Gem wanted a bagel too, of course. We ate them on the lawn behind the London Eye, but they were really not that good. All the fault of the bacon, of course. We locked up there and then enjoyed the festival on foot. Gem went to sleep soon after, and snoozed almost all the way to Tower Bridge. Before heading back, we had a wonderful couple of Souvlaki and chips at the Real Greek. Gem had claimed not to be hungry before that, but then she ate up half the bowl of chips! Our ride home was just as nice as the ride there, except that we have yet to find an equally pleasant route between Mayfair and Regents Park heading north (various one-way streets always get in the way). And for a real treat to top off the day, we saw the changing of the guard at St James' Palace! The Extreme was a model for the season 2004/05, an excellent choice, the jacket has now become the Storm and available in the Yellow, hope you are enjoying the jacket, please let me know if we can be of any further assistance. Here's a link to the jacket. It only took them a day to get back to me - not bad. I have their Gore Tex overtrousers too, and they've been great. It's really rainy today and I biked Gem to nursery, and both of us were comfortable and dry the whole time! On my way home from Condor yesterday, I got a flat. 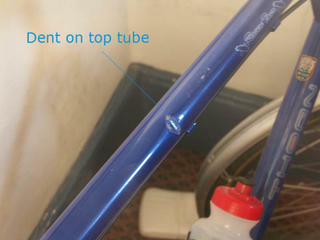 In the back, no less, which is really hard to repair because of the fiddly SRAM hub gear and non-QR spindle. Impossible, in fact, with no tools. But since I was just around the corner from Bikefix and had some time to spare, I decided to drop it in and pick it up today. Now, I've had my problems with this place. The owner (Stuart) is generally helpful and friendly. At the Cycle Show two years ago, he was particularly chatty when Kim and I turned up on his stand. But he seems to have little influence over the workshop, where they're usually abrupt, condescending, and surly. When I dropped off, the guy was friendly enough - he said they might have it done by 18.30, in which case, they'd ring me. Never happened, so I guess they didn't get to it until today. So I picked it up today as planned, and everything was fine. £12 for a new tube and labor, not bad. The guys who were there today were the surliest of the lot - one of them I've heard berating other customers after they've left the shop. Not too impressive. I sent off some pictures of the dent to Robin Thorn Saturday, and today he responded. Here's one. Not unexpected, I suppose... but even the subsidized cost is a bit much to spend for a conceit like this, as Robin says that it shouldn't affect the life of the frame. As he says, "Just to go back to why it dented, it's a bit like stilleto heels, the wooden floor in a car showroom can support the weight of truck, but the girl wearing stilleto heels still puts dents in as she walks across it." I cycled to a meeting near Old Street yesterday, which gave me a good opportunity to browse Condor Cycles in Gray's Inn Road. I was looking for a waterproof cycling jacket to replace my old Gore Bikewear jackt, which I've effectively worn out. It's served me well, though - it's kept me dry through all sorts of rain and ice storms for the past two years. But was my 40th, after all, so I figured I could splurge a bit and went for the Freestyle Extreme. I couldn't find it on Freestyle's website, so it may have been discontinued. That's all right, though. 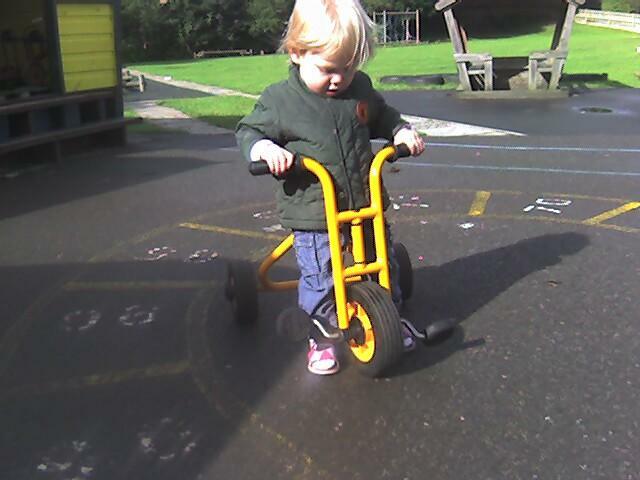 I wore it this morning taking Gem to nursery, and was great! For my first ride for over a month (because of holidays), I did a short (17 mile) jaunt through town. An absolutely autumn-like day, it was drizzly and coldish. I only got out in the afternoon, so I didn't have much time, thus I did my favourite touristy route. I headed down to Hyde Park and then east towards Speakers Corner, but I had to turn around because of the throngs attending the BBC Proms outside in the park today. But no matter, it was clear around the Serpentine, so I made it to the bottom of the park that way, then I turned back East along the south side of the park to Hyde Park Corner. The road was closed, so it was a delight to ride. 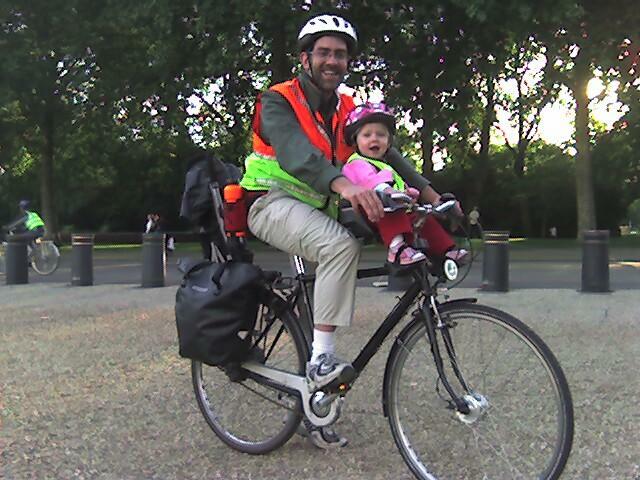 Lots of families out on bikes today - I took a picture of one woman and her passenger. Then down to Buckingham Palace and up Pall Mall, and across Westminster Bridge. Not too much traffic, and lots of bikes out today. For my first ride for ages, I kept it slow, around 13mph on average, and just stuck to enjoying the ride. Once on the south side, I followed Route 4 down to Southwark Cathedral, where I decided to turn around so I could make it to Waitrose before closing at five. Before heading back, though, I stopped into the bike shop there to check out their waterproof jackets. They didn't have the Gore one I'm looking for, it was all Altura and one Nike that I hadn't seen before. So I gave them a miss and headed on home. My top tube dent didn't affect the ride, except for the niggling feeling it gives me while I wait for Robin Thorn's reply about how he wants to handle it. I've finally decided to retire all my moldy old water bottles, so I used one of our Sigg bottles. Sure, the water tasted great, but the top of the bottle was a nuisance - having to pull it open with my teeth was a real hazard.